Feb. 16, 2013 – The spring Best of the Northwest 24th annual art and fine craft show will be held March 23rd and 24th at Seattle’s Smith Cove Cruise Terminal on Pier 91 by the Magnolia Bridge. The show will feature more than 140 talented regional artists selling their amazing handcrafted work – everything from jewelry, designer clothing, and paintings to works of glass, metal, wood, clay and more. Relax and enjoy locally crafted wines, beers and ciders; Blue Moon Brewing Co. and the Family Wineries of Washington State will be hosting beer, wine and hard cider tastings throughout the two-day festival. Musical entertainment will be provided by live bands, including bluegrass, Dixieland, Cajun and jazz, featuring local favorites such as gypsy jazz group Pearl Django. Grab a bite to eat and be inspired. Enjoy drop-dead views of the Sound, the city and the mountains from a lively working dock at Smith Cove Cruise Terminal. Admission is $6 online or $7 at the door. Children 12 and under are free. Ample parking is available for $5 all day. For tickets and more information, visitwww.nwartalliance.com. Show Times: Saturday 10 a.m. – 6 p.m., Sunday 10 a.m. to 5 p.m.
COMPANY: Northwest Art Alliance — a non-profit 501(c)(3) corporation — juries, curates and produces The Best of the Northwest art shows, featuring the works of established and emerging artists and fine craftspeople since 1989. I’m a new weaver who came to your meeting last month as a guest of Judy Parkins; we sat at right front table — enjoyed the “show-and-tell” and basket weaving presentation enormously! Thanks for the fabulous day. Unfortunately, I left my weaving book (older paperback with no color photos and with a taped rip to back cover) on our table (didn’t have my name in it). Wonder if someone may have put it in the library? Lastly, I’m very interested in renting a 24″ rigid heddle loom with stand for about two months, while I learn a bit more. Is there a way to pass on my request to the general membership? A newsletter? The blog? 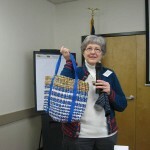 Information on this local fun event came from one of our visitors at the February meeting, Judy Schoder. Check out the information and mark your calendars: May 17, 2013 for the Girls Night Out, sponsored by the Olympia Downtown Association. Girls Night Out is an all day event enticing hundreds of women shoppers into downtown Olympia! What makes this event different than any others? It is a fundraiser benefiting a local cause. Past causes have been YWCA – The Other Bank, the Downtown Graffiti Management Program, SafePlace, Thurston County Food Bank and Olympia Artspace Alliance. Plus this annual event climaxes with a fun reception where amazing prizes donated by downtown businesses will be raffled off! Here’s how it works. Women who want to come to Girls Night Out must purchase a ticket for a goodie bag (supplies limited). Pre-purchase your goodie bag between April 26 and May 16 for $10. On May 17 it will be $15. Pre-purchase locations are: Olympia Downtown Association (116 5th Ave SE, Suite F), Courtyard Antiques (705 4th Ave E) and Vivala (111 Market St NE). You can also pre-purchase your goodie bag by calling (360) 357-8948. Look for the pink balloons and event posters identifying the many participating businesses. You will be given one raffle ticket for every $10 you spend at the participating businesses. So the more you spend, the more chances you have of winning fabulous raffle prizes! Then at the end of the event come to the reception. The reception is at 8:30 pm at The Washington Center for the Performing Arts, 512 Washington St SE. Doors open at 8 pm. At the reception you will enjoy complimentary appetizers and a no-host bar and mingle with all the ladies. You do not need to be present to win in the raffle. For more information, contact the ODA office at (360) 357-8948, odaevent@tss.net or visit http://www.facebook.com/girlsnightoutolympia. Intercity Transit has extended their Dash service to 8 pm on Girls Night Out! Take the Dash from Courtyard Antiques to Vivala and everywhere between! For more information on the Dash and Intercity Transit, visit intercitytransit.com. Now is the time to start thinking about the upcoming 2013 Thurston County Fair and the projects that you’ll be making for exhibiting. It’s never too early to start. We are working diligently to assure the 2013 Thurston County Fair is a huge success in the Open Class Home Arts Department. Despite what you may have heard or read, the Thurston County Fair is alive and well and needs your support and participation more than ever. I’m excited about what will be happening during the fair this year. Please put the dates of July 22 through August 5 on your calendar so you’ll be available and ready to participate in the 2013 Thurston County Fair. “I am the educational chair (workshops) at the Seattle Weavers Guild and would like to let you know that a few more slots are open for the upcoming Nancy Hoskins workshop scheduled March 2 + 3 in Seattle. If anybody is interested in the workshop, please contact me (sunshein21@yahoo.com or call 253-217-829 between 9 am and 9 pm). 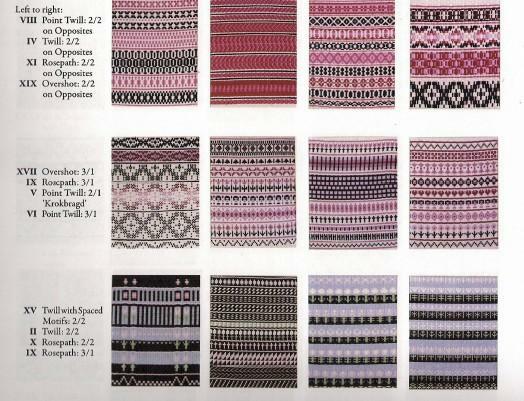 friendly workshop you will discover how to draft, design, and weave weft-faced textiles that are both decorative and durable by weaving a set of examples with patterns — geometric, floral, flamepoint, or figurative — on a variety of threadings and shafts. Table or floor looms with 4 or 8 shafts will be dressed with plain weave, twills, point twills, krokbragd, rosepath, and other threadings to create colorful boundwoven cloth.